Marjutin neuleet: Greetings from Riga! 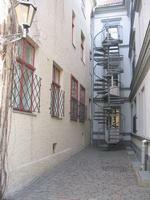 The four-day-trip to Riga is over and soon so will be my winter vacation... Sigh. 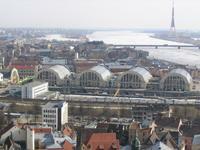 Riga is located near the Baltic Sea and it is the capital of Latvia, the Baltic country between Estonia and Lithuania. 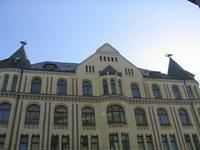 There are about 815 000 people living in Riga. In the 14th and 15th century Riga was an important trade center in the Hanseatic league, and even today it's still an important transport junction. 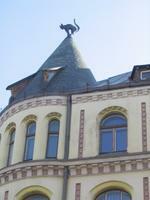 Jussi will tell more about the sights and history in his blog when he has the time, but I have to mention that close to the hotel is the Cats' House with two cats on top of the roof. That was a must-see since we left our cats at home to our neighbours' good care! Here's a good tip: if you travel to Riga, go and find a copy of the bi-monthly magazine/brochure Riga this week, it's a great source for information on everything that is going on at the moment, what to see - and it's got a map of the city. What's best, it's free! Another tip: try the pelmeni. They're sold in self-service bars, they're ridiculously cheap and tasty. They're like tortellini or ravioli and filled with meat or vegetables. The Latvian language belongs to the Indo-European languages, so it is distantly related to the Slavic languages and even to English and other Germanic languages. That's very distantly, you need to go back milleniums to find a common ground. More exactly the Latvian language belongs to the Baltic language family, the other language in the family being Lithuanian (the third language, old Preussian, has become extinct). The languages separated about 1500 years ago, so despite of some similarities in, for example, greetings, the languages are now so different that someone speaking Lithuanian would not understand a person speaking Latvian or vice versa. What I admired is that the Latvian language seems to be very strong or resistant againts foreign influence even though there are only 1,4 million people who speak it. 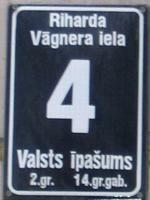 It adjusts the spelling of names to the Latvian way and assimilates them so that the masculines have s's in the end and feminines e's. I saw books by Dz.K. Rowlinge, Duglass Adamss and Nils Geimans - and can you guess after which famous composer who lived in Riga this street was named? I've studied linguistics so what really caught my attention was the similarity of some words in the Finnish and Latvian languages - and I don't mean the new loan words that are almost the same in every language nowadays. What I mean are the loan words the Finnish language got from the Baltic languages ages ago, and I'm going to make a wild guess now about them. By the way, Finnish does not belong to the Indo-European languages but to the Uralic language family with, for example, Estonian, Hungarian, and Sami. However, there was communication all along on the area, so words got loaned from one language to another like they still do today. Now, I don't know how to get the Latvian letters from the keyboard so my apologies for the incorrect spellings. Anyway, the loan words, and my guesses: for example, in Latvian maja means "home, house" and in Finnish it means "a cottage, cabin, hut" and in some sayings also "home" (like "welcome to my humble home" - "tervetuloa matalaan majaani"). Maksat (that's the basic form) means "to cost" and is in Finnish "maksaa". Tornis means "a tower", in Finnish it's "torni". Tumvais means "dark", in Finnish it's "tumma". I also saw the advertisement for the movie "The Interpreter" which was in Latvian "Tulks" and if the name was translated into Finnish it would be - can you guess it now? - "Tulkki". 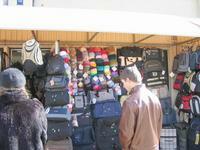 What was funny is that the Latvian word for a market place is tirgis - or that's not funny but the rest of the story is. The word must be related to the ancient Russian word trg which also gave the word "turku" to the Finnish language, first meaning a market place and then only the city Turku. However, the word turku in Latvian happens to mean "Turkish". 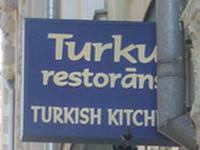 I have to admit staring for a while when I saw the sign for a "turku restorans". Oh, still talking about Turku for you who know the Finnish hamburger scene: there is also a Hesburger in Riga. Hesburger is like McDonalds or Burger King and originally it was founded in Turku. And yes, there is also a McDonalds in Riga. Come on, tell me about yarn shops now! If I compare the city to Tallinn, finding yarn is a bit more difficult. 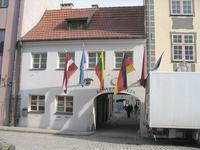 In Tallinn you can find the local wool yarn and unspun yarn in many souvenir shops and in Riga you cannot. I saw yarn only in one souvenir shop which was located on the Ratas pazaza shopping alley near the House of Blackheads (the tourist info is in the House of Blackheads, by the way). Of course you can go and get lost on the Central Market Place. It's a huge place. Believe me, it's huge. Take a look! There are five hangars built for zeppelins. Inside the hangars are quite nice and clean and definitely worth seeing. In one they sell meat, in the other fish, then vegetables, dairy products, pastries, cakes, flowers, chocolate, clothes, electronics... Around the hangars is the market place. 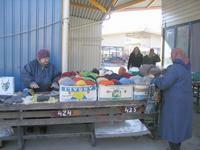 There was also a friendly old lady who sold wool yarn for 7 lats a kilogram. The colours were lovely! 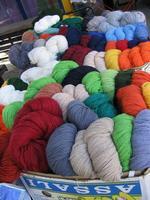 However, there were no multicoloured yarns, but a lot of yarns anyway. We found her on the second day, on the first day we must have passed her from a close distance but most likely turned the other way and missed her table then. 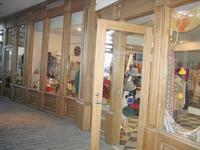 Then there is the Filati shop on 3 Zirgu iela (Horse street) just like there is one in Tallinn! We found that by accident. We were on the way back to the hotel and Jussi turned round one corner and what did I see? The shop had a sale until March 31st. Wasn't that a pity? The shop sold ONline yarns, Lana Grossa, some Italian yarns, Addi needles... One of the saleswoman spoke a little English and the other didn't. The prices of sale yarns ranged from 0,39 lats to 0,79 lats per ball and the normal prices were mostly from 1 to 3 lats, so that seemed to be pretty much the same as in the Filati Tallinn shop. So, I got yarn. What else makes a girl happy? 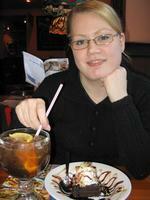 A chocolate fudge cake and an ultimate Long Island Ice Tea at T.G.I Friday's. And what did Jussi get to make him happy? 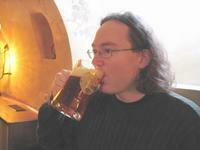 Well, the beer was cheap and we went, for example, to Alus Arsenals (alus means "beer", by the way) where Jussi had... err... a light snack called 1000 mm. If you're a vegetarian, please look away now. 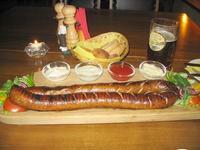 It's one meter of grilled sausage! Yikes! And another beer!